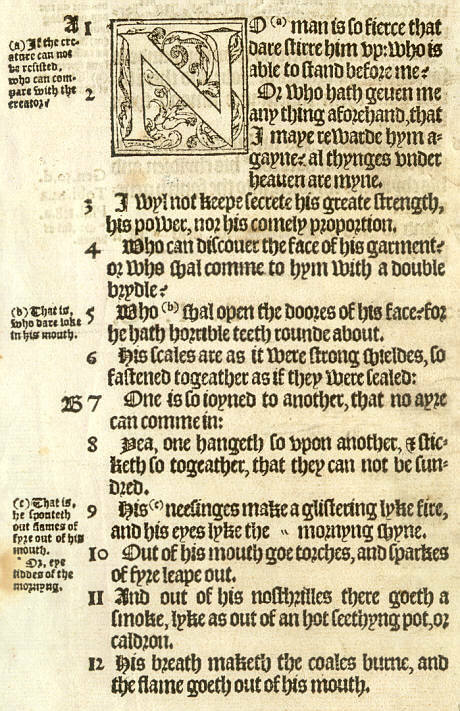 Note the letter "A" is printed before Verse 1 and before Verse 7 is the letter "B". Verse numbering was not invented until 1555. Before then, chapters were divided into 4 or 5 sections, each indicated by a letter. In this arrangement, a single letter is used to indicate a section of 6 or 7 verses. This made it difficult to refer to a specific phrase in Scripture. This edition of the Bishops' Bible included both Verse Numbers and Section Letters — making this excerpt Job 41:1-12 or Job 41:a-b. It is easy to see that the Old English Black Gothic typeface makes the Scriptures hard to read. But by using the same typeface, just shrinking it down, Old English makes the Marginal Notes almost unreadable. This example shows well the "creative spelling" that was common at that time. Don't be thrown by words like lyke (like), ayre (air), or myne (mine). Don't let the extra letters confuse you in words like thynges (things), doores (doors), and sparkes (sparks).